Based on the mythical night-time creatures who come out and eat your homework (you remember that little excuse to teacher, don’t you? 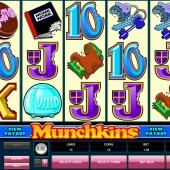 ), renowned developer Microgaming’s 5 reel, 15 pay-line slot, Munchkins, takes a neat little idea and runs with it in classic slots fashion. There’s plenty of evidence of the little critters on the reels, and although you can’t see them, you can certainly see their handiwork: chewed homework books, a wallet with a big bite taken out of it, and a keyring munched to within an inch of its life. Even the regulation 10-through-Ace symbols have had bites taken out of them! Is there nothing sacred in this wretched world any more?! You’ll only see the Munchkins themselves when you hit on the Wild icon – here, the Wild blue capsule thingey (actually we, think it’s a soup tureen). Five Wild blue capsule thingeys pay out 15,000 coins when you hit them across the reels, so it’s definitely worth hitting. They also substitute for all symbols other than the Scatters. Look out for the chocolate cookie Scatter. Three or more anywhere on the reels will trigger the free spins bonus feature. Here you’ll bag yourself 20 free spins with a 2x multiplier attached. Not only that, but spins can be re-triggered. 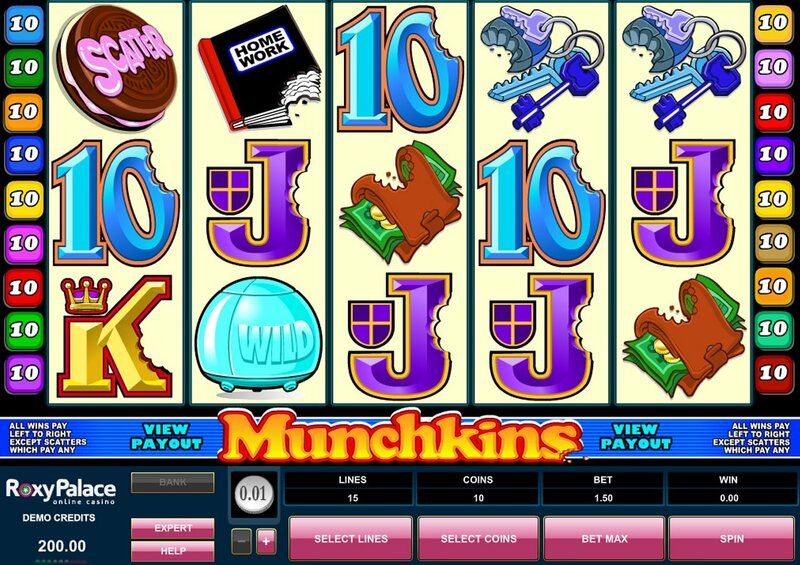 Munchkins is definitely one of those video slots that will work well on a mobile device: it’s fun, simple to play, and the graphics are clean, if unspectacular. The Wild symbol opening to reveal the greedy munchkins is about your lot for animation but it’s fun while it lasts, and it’s nice to see a free spins total over 15. If fun, colorful slots play is your thing, and you’re wedded to the idea that Microgaming are the people to provide it, try out the developer’s other basic slots like the ghoulish slot, Monster Mania or the cartoon-inspired madness of Wildcat Canyon – both offer similar thrills.